Nearly all of us have at least one wheelie bin on our property, and many of us might not even think about our bins. But you can make your life a little easier when it comes to that wheelie bin (or two). Think your wheelie bin is as good as it's going to get? Think again and read through our helpful wheelie bin tips and tricks! Got a stinky bin? Seems like a stupid question, bins are meant to be smelly, right? Well, they don't have to be that bad. A bin generally stinks because bin bags leak, and that's where a handy bag of cat litter comes in. Cat litter is pretty cheap, and a thin layer at the bottom of your bin should absorb most leaks. Even better, some kinds of cat little are deodorised, meaning that they'll mask smells too. Just remember to top up with litter after your bin's been emptied, and you'll never dread that trip to the bin again. Okay, we get it, wheelie bins aren't exactly attractive. That means that it might be tempting to keep them at the bottom of the garden or hidden behind a hedge or something. However, when it comes to placement, closer to home is better. Why? Simple convenience. A wheelie bin that's a few steps from the back door, or that's on your way off the property, is easier to get to and therefore more likely to be used (especially if it's raining). If you want your spouse or kids to take out the rubbish more often, then keeping your bin close by is going to make things easier. If appearances bother you, then invest in an attractive wheelie bin cover to hide that bin away. Wheelie bins are fairly indestructible, however both the wheels and the handle can sometimes break. If this happens to you then don't feel that you need to replace the whole bin. Most councils will charge you for a new bin, however many will perform simple maintenance (such as replacing wheels and lids) for free. Check out the webpage of your local council to find out more. As we mentioned above, a wheelie bin cover can be a great option if you want to keep your bin close by but don't want to have to see it. But if you do make that investment then it's in your own best interest to keep that cover in tip top condition. What does that mean? Well, as you know the UK doesn't exactly have the best weather in the world, and all that damp can make wooden covers rot. Protecting the wood with a special stain once a year or so should be more than enough to stop that happening. Don't forget to look for stains with anti-fungal agents too, if you don't want algae, lichen or moss! Nobody wants to battle flies when taking out the rubbish, and seeing maggots is even worse! Fortunately, there's a simple enough tip that should help you avoid most flies. Flies tend to be attracted to food and lay eggs on it which then develop into maggots or larvae. Simply wrapping up food waste in newspaper before putting it in the bin can help prevent this. If you keep your wheelie bin in an alley way or in a bin cover, then think about putting some fly paper around as well, since this will kill any flies that do happen to come along. Yes, your wheelie bin should be cleaned, since this will help keep odours down and prevent insects too. You don't need to clean your bin every week, but once every couple of months is recommended. To clean your bin simply fill it with soapy water or disinfectant and water. Our pro tip here is to use one of the brands of dishwashing liquid that promises to work in cold water. This way you can use the cold water from your hosepipe to clean your bin so you don't need to take it inside. 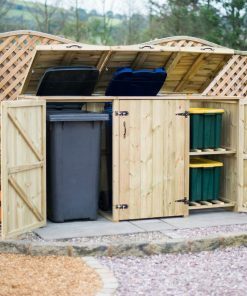 Your wheelie bin should ALWAYS be kept with the lid closed, since this means not only that smells won't travel but also that flies won't be able to get inside to lay eggs. If you find that your wheelie bin is too full by the end of the week and that you can't close the lid then you have two options. First, look into recycling more of your waste, particularly paper since this will cut down on bulk. Secondly, you might want to contact your local council to find out if they have larger bin models available, or to see if you can get a second bin. Placing your wheelie bin in direct sunlight is a no-no for a few reasons. Firstly, heat and light will fade your bin and degrade the plastic, making your bin more fragile and liable to break. Secondly, warmth will speed up decomposition inside your bin, meaning that it will smell worse. Keep your bin in the shade wherever possible. 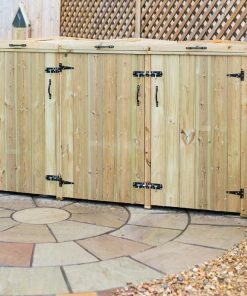 If you don't have a shady spot, then again, you might want to consider a wheelie bin store or cover as an alternative. We've already mentioned recycling more of your waste, but if you want to keep your bin odour free (and less full) then you will need to watch what you throw away. If you've got a baby in the house, for example, then emptying nappies over the toilet before throwing them away will mean less smells. If you've got a garden, then composting food waste instead of chucking it could be a good solution too. And always make sure that you abide by your council's rubbish rules, and don't put things in the wheelie bin that aren't allowed, since you'll risk your bin not being collected at all.